Ko Tarutao National Marine Park is considered to be one of the most exquisite beach and dive destinations on Thailand's southern shores. The park comprises of 51 mostly uninhabited islands, all of which are located in the Andaman Sea near the Malaysian island of Langkawi. Three of the islands Ko Adang, Ko Lipe and Ko Tarutao can easily be reached from the coastal port of Ban Pak Bara on the mainland. Ko Tarutao is where you'll find the park's headquarters. All these islands are only accessible to visitors from mid-November to mid-May. During the rest of the year, most amenities are officially closed to all tourists as monsoon storms can make it extremely risky for the ferries to make the crossing. The best time to visit the park is during the Thai, Chinese and Western New Years. If you'd to stay over during this period, you might have to book your accommodation well in advance as the bungalows here fill up rather quickly. But for centuries the islands around these parts had a somewhat sinister prominence as a haunt for pirates. However, they have long since abandoned the area and it's now perfectly safe for tourists to explore. Jack Sparrow would have had a field day here had he discovered this region a lot earlier. It wasn't until the 1940's that the British Royal Navy finally curtailed the pirate raids. The only people to invade the area now are tourists. The whole archipelago extends over 580 square miles (1,490 square kilometres). It became Thailand's first national marine park in 1974. The park includes some of the most spectacular and unspoilt scenery coupled with an abundant wildlife. The forests and seas support an incredible variety of fauna with langurs, wild pigs and crab-eating macaques being a common sight. Lesser known sighting includes several unique subspecies of squirrels, tree shrew and deer. The park is also home to over one hundred species of bird with reef egrets and hornbills frequently being seen. If you are lucky, you might spot a white-bellied sea eagle, a pied imperial pigeon or a frigate bird. Twenty-five percent of the world's fish species are believed to inhabit the surrounding seas, including a rich concentration of some ninety-two species of tropical coral fish. Offshore sightings of sperm and minke whales, dugongs and dolphins are not uncommon around here. The island is also home to hawksbill, leatherback, green and small Olive Ridley turtles (though dwindling in numbers). Ko Tarutao is the largest island in the group measuring 26 kilometres (10 miles) in length. Much of the island is covered in a semi-green tropical rain forest which rises steeply to a height of some 700 metres (2,300 feet) at which point you will be awarded some of the most wonderful natural scenic views imaginable. To get there, take the ferry from the village at Ban Pak Bara on the mainland. The boat will drop you off at Ao Pante Malaka Pier on the northwestern side of Ko Tarutao where the park's headquarters is located. Once there you will find a visitors centre, a library, two restaurants and the only shop on the island selling mostly essentials. From here you can take part in several diverse daily activities. Here's a great opportunity to take part in a 2-day scuba diver course in Ko Lipe, a tiny island that forms part of Tarutao National Marine Park in the Andaman Sea. A scuba diver course is the first step to obtain a license and let you dive anywhere in the world up to a depth of 12 metres (59 feet) under the supervision of a dive professional. 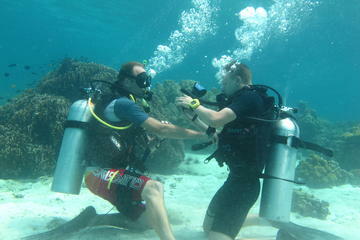 The scuba diver course as described above will literally open doors to a whole new world! The course normally takes 2 days to complete and operates every day. We limit the size of the groups to a maximum of 4 students per instructor. So you'll have more time to practice and receive more guidance from your instructor. Your safety is always our top priority. Here's wishing you all the best in achieving your goals. One very worthwhile excursion is to climb To-Boo Cliff for the spectacular views it offers of the surrounding islands as well as the crocodile's head cape at the north end of the bay. The steep half hour climb is a must, especially at sunset. Another equally enterprising activity would be to take the one and a half hour long boat trip from Ao Pante pier to the stalagmite filled Crocodile Cave. The trip will take you along an inland canal through a bird filled mangrove swamp. You may think that going to a cave of crocodiles is somewhat crazy if not a little scary, but there really is no need to panic as you are unlikely to see any of these giant snappers here. The only mammal sighting you'll get to see would be that of an odd otter or perhaps even a small soft-shelled Olive Ridley turtle. If you are looking for a luxury resort or two in which to stay the night, I'm afraid you've come to the wrong place. Most of the accommodation here is at the very bottom end of the market. Lodgings consist mostly of communal bungalows and longhouses. Would you like to know what a longhouse is! It's just that, a long house with lots of beds. If you don't mind sharing and sleeping rough then that's a completely different story. Oh! Did I mention that there's no hot water either? Never mind, perhaps the only other solution would be to hire a tent and sleep on the beach. After all the nights are still pretty warm here in the tropics. Speaking of beaches there are several pristine soft white sandy beaches dotted along the north-west coast of the island, most of which are within easy walking distance. The beautiful bays of Ao Jak and Ao Molae are a half hour walk from Ao Pante. These two quiet beaches here are fringed with coconut palms and complimented with soft white sand. A great place to spend the day relaxing. Need I say more. Beyond the next headland is beautiful Ao Sone beach which is fringed with casuarina trees but otherwise equally as stunning. The beach is also a favourite site for sea turtles who come here to lay their eggs. The major part of the bay sports a long sweeping shore of flawless soft, fine sand and crystal clear waters. There is a one hour trail leading up to a wonderful waterfall at the north end of the bay and another slightly longer trail to a waterfall in the middle of a mangrove swamp at the far south end of the bay. Ao Sone beach can be reached either by car from the park's visitor centre along one of only two roads on the island or if you prefer, you can walk there though it will take you about two hours to reach. The only other road takes you through a rubber plantation and evergreen forest to the east side of the island where the rocky bay of Ao Taloh Wow is located. From Ao Taloh Wow, you can set off along an overgrown trail through the forest to the sandy bay of Ao Taloh Udang located in the southern part of the island. Be prepared for a long haul as this trail will take you a good five hours to reach. If you do make the trip, you'll get to see the visible remnants of a penal colony set up to house some of Thailand's political prisoners. It would appear that all political prisoners are imprisoned on one or other island around the world at some stage of their lives. Some of you may recall Nelson Mandela being incarcerated on Robben Island in South Africa for many years. He later went on to become the first black person to take up the presidency of that country. Apparently, the author of the first English-Thai dictionary, as well as a grandson of Rama VII along with the plotters of two failed coup attempts were imprisoned on Ko Tarutao Island in the late 1930's before returning to a high government post. Seems this is the way to go if you wish to travel in a similar direction. However, ordinary criminals imprisoned at Ao Taloh Udang as well as Ao Taloh Wow had a much harsher time. During World War II when supplies from the mainland dried up, prisoners and their guards ganged up, and together turned to piracy. This resulted in a lucrative business that was only stopped after the war when the Thai government asked the British in Malaysia to send in troops to bring about some sort of order. The main problem today is not so much the pirates and smugglers, but the illicit trawlers fishing in the national marine park waters. The wild and somewhat rugged Ko Adang is one of only three inhabited islands in the archipelago that offers accommodation albeit on the rudimentary side. Isn't it nice to know that there are some places in Thailand that are not as exploited as many others have over the last couple of decades? Therefore, you won't find huge crowds here as in the more commercialised zones. Enjoy it while you can. Ko Adang is much more low key and acts mostly as a springboard to some great snorkelling opportunities than anything else. Most of the island is thickly carpeted in a tropical rainforest with many of them having year round waterfalls. Some form freshwater rock pools such as Rattana Falls on the south-west coast is where you can take a cool dip while overlooking the sea. The nearby Laem Sone is where you'll find the park station and a steep and narrow beach backed by a thick canopy of pines. The smaller island of Ko Lipe makes a busy but extremely pleasant contrast to the other islands as it sports a relaxed and laid-back atmosphere with an equally mellow nightlife (not to be confused with the nightlife in other parts of Thailand) Ko Lipe is a small flat triangle of land located two kilometres south of Ko Adang. The footpaths through coconut plantations allow you to enjoy a leisurely stroll. More than that, it has one of the most immaculate and prettiest beaches you could ever come across in southern Thailand or for that matter, the country. This beach is Hat Pattaya, a shining and shimmering crescent of squeaky clean, soft white sand coupled with exquisite turquoise waters. It's pure pleasure. Ang Thong is a small group of islands spread over part of the Gulf of Thailand west of Ko Samui. The region is popular for its beautiful beaches, limestone caves and abundant wildlife. Canoeing and snorkelling among the coral reef are a major attraction. Khao Lak stretches across several scenic strips of sandy upper Andaman coastline. The region is particularly famous for its spectacular scenery of steep rain forested ridges that extend down to the winding coast. An elephant trek to one of the waterfalls is a must. Khao Yai is the oldest park in Thailand and encompasses a mix of evergreen and deciduous tree forest with grasslands and scrub as its secondary growth. Wildlife roams its interior, including endangered species such as elephants, tigers, leopards, white-handed gibbons and sambar stags. Khao Sok is the largest and most dramatic tract of virgin rain forest in southern Thailand. The peaks rise to spectacular heights while the forest helps protect the population of elephants, bison, jungle cats, wild dogs and other endangered animals as well as many bird species. Doi Inthanon encompasses the highest mountain peaks in Thailand and has several types of fauna and flora, waterfalls and a wide range of animal life such as leopard, Pangolin and flying squirrels. There are also several bird species such as the hawk, eagle and Eurasian woodcock. Khao Phra Taew National Park is located on Phuket Island in southern Thailand. It is the island's last main outpost and primary evergreen rain forest. Within the national park are several waterfalls and it's also a home to the Gibbon Rehabilitation Center.